William began his art education studying with John Perri at the State University of Wisconsin. After serving in the armed services, he returned to Wisconsin to study with Don Reitz at the University of Wisconsin, Madison. William was a resident craftsman at the Penland School and after several years as a studio potter, he began to teach ceramics at ETSU. William currently lives and works in Cleveland, Ohio. He has a studio in the old steel making district and has taught ceramics at the Cleveland Institute of Art for the last 31 years. In 2002, he was awarded a McKnight grant and traveled to Minneapolis, MN, where he was a resident artist at the Northern Clay Center. At the end of his residency, he returned to Cleveland and resumed teaching at CIA. 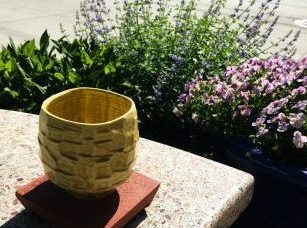 “I spend three days each week teaching at the Art Institute and the rest making pots and doing commission work in my Tremont studio.” His work combines several pottery techniques and the piece you can win this June has been both thrown and hand carved. We offer a beautiful tea bowl and red earthenware stand to the winning entry of our June Artist of the month.